Nutritional supplements and natural herbal remedies don’t have to be in capsule form. Example is this healing herbal rice I have prepared for our meal yesterday. a tasty and tantalizing herbal basmati. Possessing great inner strength and capable of exerting strong nutritional benefits, this herbal rice with healing fire in its heart is the kind of meal that would provide a nourishing surround to a flourishing imagination. How it Works: After payment via Paypal, PDF file will be emailed to you to download the recipe. For any questions about the recipe or the download process, please email me at mailmahanandi@gmail.com . 1: Soak almonds in warm water for about 30 minutes and then peel the skins. Grind rice to fine, using a blender or spice grinder, until a semolina like texture is achieved. 2: Combine the rice powder, almonds and cardamom. Add about 4 cups of water and mix. Keep the mixture covered overnight. 3: Next morning, place the mixture and jaggery in a stone grinder or blender. Gradually adding two cups of water, blend to smooth. Pour the rice milk through cheesecloth or filter into a bowl. Gently squeezing/stirring, extract the milk. Refrigerate the rice milk for about 15 minutes. Serve and enjoy. If you wish, add lemon or orange juice and bananas to the milk and blend to make a great tasting rice milk smoothie. The idea here is to use unpolished, unmilled rice. If you think for a minute, it’s easy to see that nutrient-rich brown rice makes a great tasting milk than the one prepared with polished, white rice. And, brown rice goodness and basmati’s sweetness make brown basmati, a perfect choice to prepare rice milk. When we lived in Houston, one of the recipes we picked up from that region was gumbo. Okra, vegetables, beans, rice and seafood/meat, together cooked in wheat flour broth (called roux). That is gumbo in a nutshell. Vijay is a big fan of seafood gumbo and often prepares shrimp gumbo at home. Being the non-meat eater that I am, I had to develop a vegetarian version for myself. The following recipe is the result of my trials. I’ve made few changes to the traditional recipe to suit my taste. I replaced roux with lots of okra and coconut-spice seasoning. And for today’s meal, fresh chickpea sprouts and brown basmati have joined the excellent cast of gumbo characters. Swampland approach, but a new appeal with Southern India seasoning, my vegetarian gumbo is a delightful one-pot dish. The side effects I have noticed so far, it’d inflict a dramatic mood change. Kindlier attitude towards fellow beings, even towards themselves, which at times could be of even greater importance, may happen. Two tablespoons of grated fresh coconut, 6 dried red chillies, 6 cloves, quarter teaspoon cumin, fistful of fresh cilantro leaves, and a pinch of salt - blend to smooth, adding half cup of water in a mixer. In a heavy pot, melt the ghee over medium heat. Add the garlic and onions and cook until translucent. Add the capsicum, tomatoes, okra, chickpea sprouts and brown basmati rice. Mix and cook, occasionally stirring for about ten minutes. Add about three cups of water and also stir in the turmeric and salt. Cover the pot with a lid and cook for about another 15 minutes. When the rice starts to get tender, stir in the coconut-spice seasoning. Mix gently and simmer another ten minutes or so. When the rice is cooked to tender, turn off the heat. Cover and let the gumbo sit for sometime. The whole thing will thicken further on cooling. Vegetarian gumbo goes well with papadams. They are great to scoop up the gumbo. I have been cooking with lemon grass a lot lately. Thanks to the strong presence of fresh seasonal produce from Asia, I can buy almost all kinds of vibrant looking vegetables readily here in Seattle. That includes fresh curry leaves and also herbs like lemon grass etc. Prepping the lemon grass for cooking is easy. For the supermarket variety, cut and remove upper two thirds of dried out green grass/stalk. Lower part, the white bulbous portion is what we want. Make a shallow cut lengthwise in the middle of bulbous portion and remove at least two fibrous, woodsy looking outer layers. That would reveal a pale pinkish-white, citrus smelling lemon grass root. 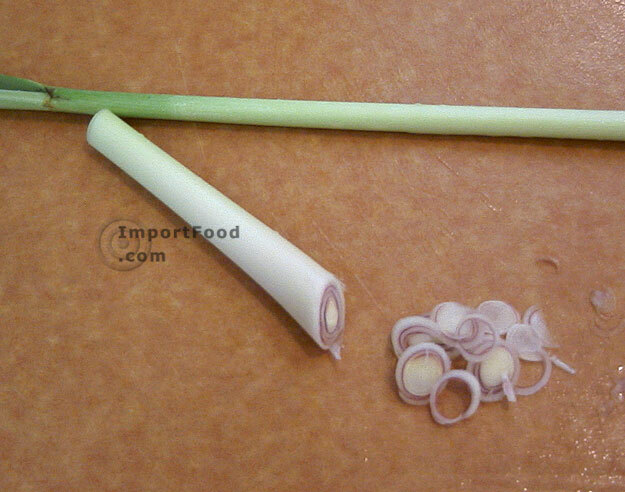 Finely slice the root into thin rings or pound in a mortar to a coarse paste. The soothing, refreshing lemony aroma is what makes this herb so special to me and I have been adding it to tea, rasam, and sambar and also to flavor the rice, mainly in stir-fried rice recipes. Stir-fried brown basmati rice from India with crisp tasting sugar snap peas and green beans, liberally flavored with lemon grass and curry leaves - this recipe has become the most frequently prepared rice in our home for the past few weeks. It is easy to put together, makes use of spring vegetables that snap, and filled with lots of flavor. Scrambled paneer, tofu or eggs adds the protein component and makes this a complete meal for us. Heat a tablespoon of oil in a wide skillet on high heat. One by one add the ingredients listed above in the order mentioned and stir-fry few minutes each. Add the cooked rice. Sprinkle a pinch of sugar and a teaspoon of salt. If you want you can also add little bit of soy sauce and chilli sauce at this stage along with scrambled paneer/tofu/egg. Stir well for a minute or two. Finish by adding some lemon juice and serve. Fragrant fried rice would be ready. Brown basmati avialable in most Indian grocery shops here in US. I’ve purposely avoided adding onions/shallots, not to clash with lemon grass and curry leaves. This is a very adaptable recipe, experiment with different fresh vegetables like bell peppers, zucchini etc.